Quickie Summary: State “Trunk” Highway 22 is one of several state highways that meander a bit while changing direction. Running right up the center of Wisconsin at first, Highway 22 winds through a number of central and northeastern Wisconsin towns, providing access to lakes and rivers that offer some of the state’s best fishing, eventually providing access to the waters of Green Bay at Oconto. The stretch of Highway 22 between Oconto Falls and U.S. 141 will be closed for reconstruction until early August. Check this link from DOT for the latest detour and project information. 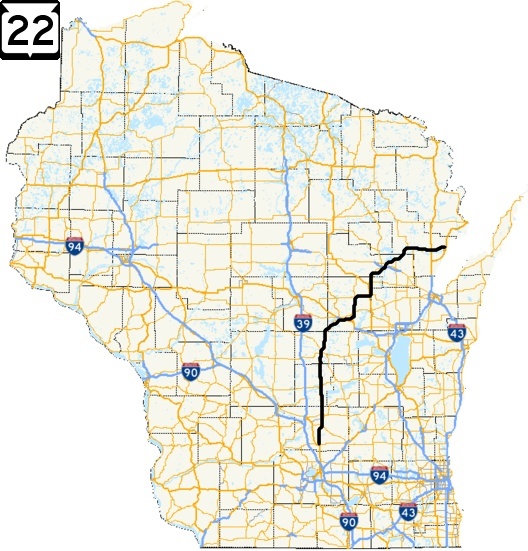 The Drive (South To North, then East): Highway 22 starts out at a rural crossroads where U.S. 51 veers away from its journey due north of Madison and cuts towards Portage; the east-west crossroad is the “coast-to-coast” Highway 60. 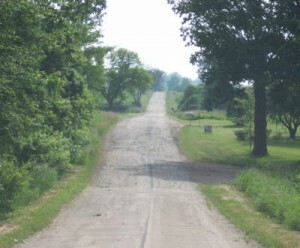 Highway 22 begins in a nondescript way as U.S. 51 veers westerly at Highway 60 about 20 minutes north of the Madison area. 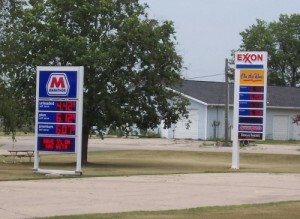 The first ten miles of Highway 22 take you through wide-open spaces – for Wisconsin – and a series of “Ethanol YES!” signs, indicative of corn and politically active farmers in the area. 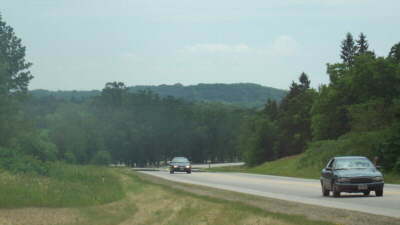 Highway 22’s southern section traverses the Central Sand Hills, an ecological landscape influenced heavily by glaciers. Within close range of this area, you have the Dells are to the west and a close passing of the Fox and Wisconsin Rivers nearby. 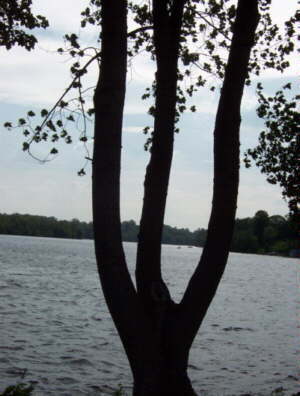 Sandy soils, abundant small lakes and many streams created an environment favorable for good fishing and crop-raising. Some good-sized hills emerge a few miles further north of where Highway 22 begins, including a pretty scenic one as you cross Rocky Run. The first town you enter is Wyocena (pop. 768), where Highway 16 crosses. They built an interchange for a “U.S. 16 bypass” decades ago, and the “old” 16 just north of it shows just how tiny some of the major routes used to be. Try following it; it’s a small side street that, prior to the 1950s, was the main route for Milwaukee-Minneapolis traffic. Makes one appreciate expanded bypasses sometimes! 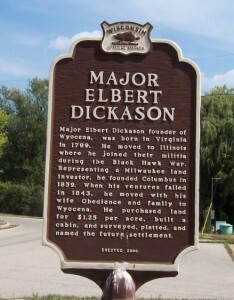 Just north of where Highway 22 crosses Highway 16 today is the marker showing the origin of Wyocena, founded by Major Elbert Dickason in 1843. His wife was named Obedience, which has sort of fallen off the “popular baby names for girls” list over the last century or two. For an area thought of as fairly flat, this part of central Wisconsin sports some sizable hills and nice views as you cruise. When the glaciers came down across the state many millennia ago, they formed ridges in this area that helped form lakes and rivers that provide great fishing today..
Three miles later lies Pardeeville (pop. 1,995) and yes, it’s pronounced “partyville”. Not that it’s known for parties… or is it? You’ll have to find that out on your own. In the middle of a Saturday, things were pretty calm. 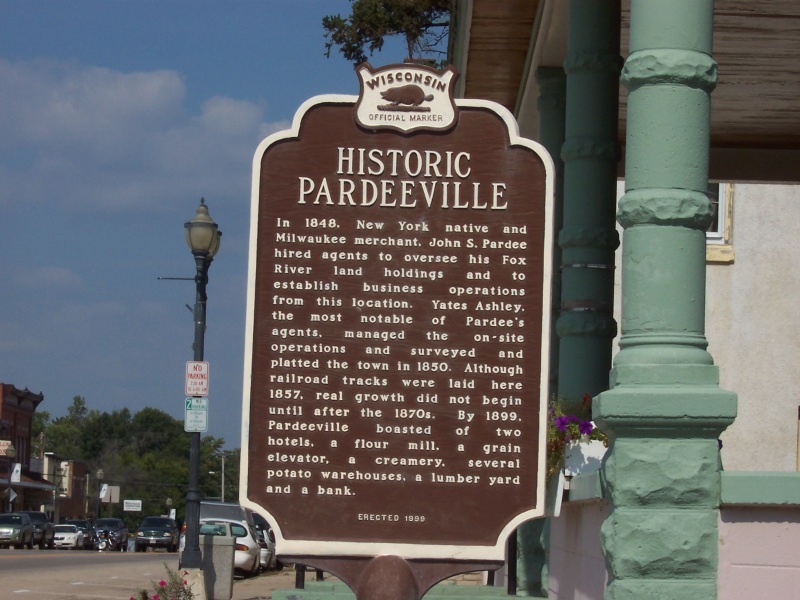 Pardeeville was named for John Pardee, a Milwaukee merchant who owned the land here and sent agents to develop it. And develop it they did – at least to an extent. The town’s location along the Fox River gave it strategic importance, especially back when the Fox-Wisconsin Waterway system was considered the possible main boat route between the Great Lakes and the Mississippi River – though that ended up not happening. 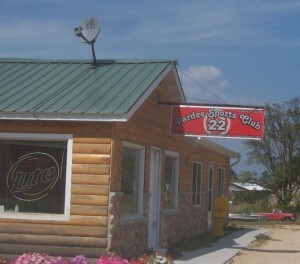 Where Highways 22 & 44 meet in Pardeeville. This is, technically, the downtown crossroads. Pardeeville’s downtown strip runs for only a few blocks; Highway 44 begins its run towards Oshkosh at this point, and 22 jogs past Park Lake and over the Fox River, the first of many crossings over that river. Thankfully, those aren’t real prices (at least as of press time). 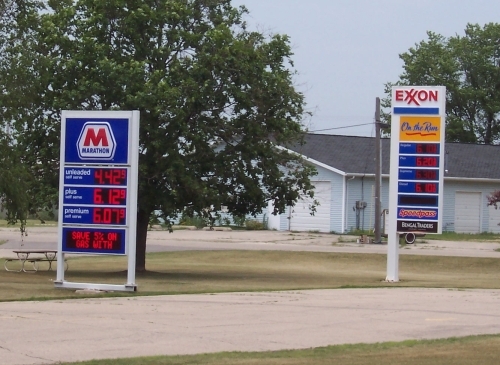 Everbrite’s facility in Pardeeville makes some of the digital price signs gas stations use. It scared the heck out of me for a second. When a business uses the road number in its name, we include a shot of it on the State Trunk Tour! Watermelon Seed-Spitting and Curling. 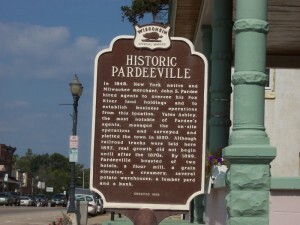 Pardeeville is big on watermelons in summer and curling in winter. 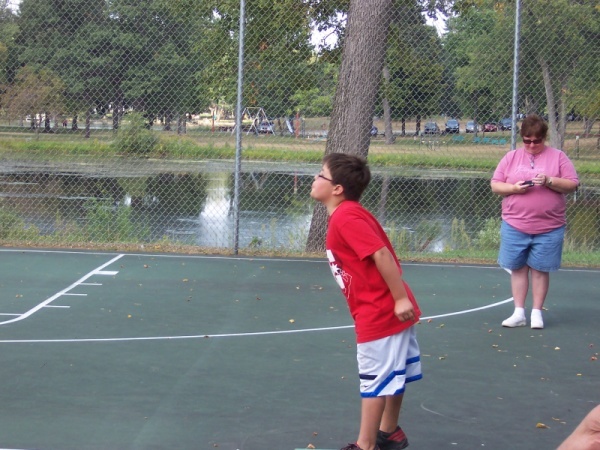 Every year, Pardeeville hosts the U.S. Watermelon Eating and Seed-Spitting Competition. One edition was visited by the State Trunk Tour, and featured here is Colton Ketter of Lomira. Spitters from all over came to Pardeeville for the chance to take home glory – and a ribbon. Creative decorations with watermelons, like the flower basket and the one puking here to the left, are also potential contest-winners.Pardeeville also has a very active curling club that has been at it since 1875; they’re just off the intersection of Highway 22 and 44 downtown. Curling Olympian Debbie McCormick hails from Pardeeville and still serves as the organization’s vice president. 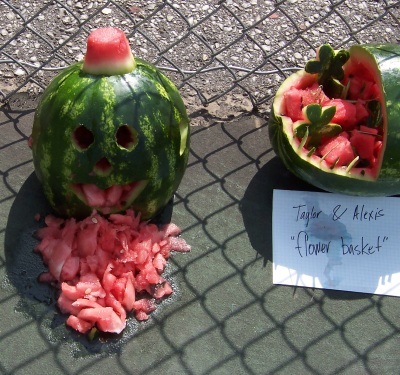 Watermelon art. Including one throwing up. Creative, if not appetizing. Between Pardeeville and Montello, County F provides access to John Muir County Park, which boasts a broad array of diverse and rare plant species, lakes and wetlands. This area was the boyhood home of Sierra Club founder John Muir (hence the county park’s name) and also features a trail and boardwalk around 30-acre Ennis Lake. Continuing along Highway 22, one notices many antique stores… and you gotta love the ones that, in addition to “classic” antiques, also sell a wide variety of live bait. The bait is popular, though, because there’s tons of good fishing in the area. 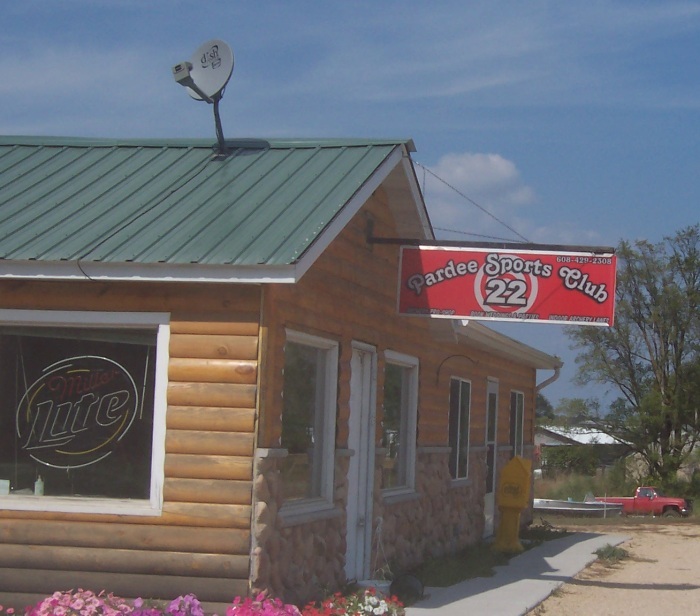 Dotting Highway 22 are side roads to Fox River and area lake fishing and recreational trails. Marquette County alone has 60+ lakes and 15 trout streams, most of which have good public access. From the “You’ll Never Know What You’ll Find on the State Trunk Tour” department: lawn jockeys in their Packer gear, lighting the way in for these Green-and-Gold-worshiping residents. This area is also home to a significant Amish population. Use caution in case you share the road with them, since their horsepower amount is usually one or two. When you reach Montello (pop. 1,495), you’re about 35 miles from the southern end of Highway 22. Montello’s downtown spreads along Highways 22 and 23, and the aforementioned Amish sell many a craft in stores along the route. 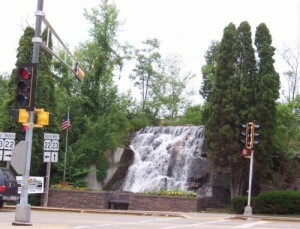 At the intersection with Highway 23, beautiful, rocky waterfalls greet you, all part of a transformed former granite quarry. Montello claims Wisconsin’s largest tree in front of Le Maison Granit, a historic mansion (oui, a French one at that) on Underwood Avenue, which requires just a short jog on adjacent Highway 23. Wedged between Montello Lake and Buffalo Lake, the city of Montello is very water- and water sports-oriented. Montello’s main crossroads at Highway 22 & 23 offer a nice waterfall. The countryside meanders north of Montello; few towns or points of interest lie between in and Wautoma (pop. 1,998), which you reach about 56 miles north of Highway 22’s starting point. 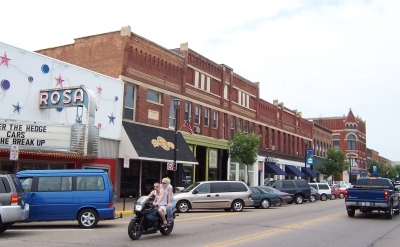 Wautoma features antique stores a’plenty and a nice shopping strip on the main street, which is along Highway 21 just after 22 turns back north to head out of town. Highway 73 also intersects here. Waupaca (pop. 5,750) is the central town in an area known as the Chain O’ Lakes. Waupaca’s name is also familar because of the former Waupaca Foundry – now known as ThyssenKrupp Waupaca – and its foundry locations in Waupaca and Marinette, with one each in Indiana and Tennessee. The Waupaca location melts over 9,500 tons of gray, ductile and compacted graphite iron castings. Actress Annie Burgstede, who played Willow Stark in Days of Our Lives and has also had roles in CSI, Smallville, Charmed, and Without A Trace, grew up in Waupaca. 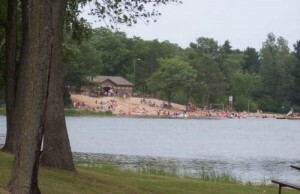 Waupaca hosts a number of events throughout the year. One popular summertime treat is Strawberry Fest, which I could only assume celebrates strawberries. On a day when I visited, downtown was loaded up with berry, berry happy festival goers (sorry, I couldn’t resist), bands playing the park, and stores eager to serve the people visiting from other places. 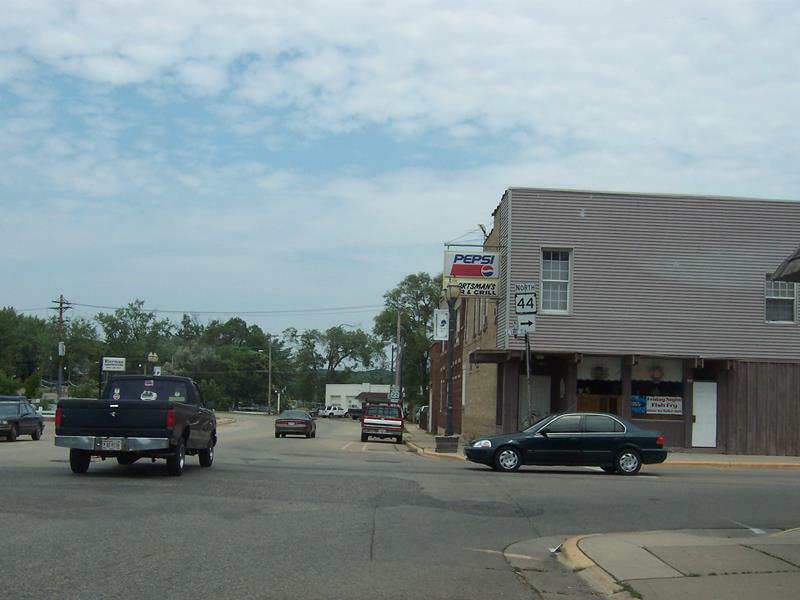 Being the county seat of Waupaca County and the largest town for about 20 miles, Waupaca bustles quite a bit for a city its size. Following Highway 54 and/or Highway 49 east through the rest of Waupaca will bring you back to Highway 22 for the trip on northeastward – if that’s a word. Highways 22 and 54 combine for a while before 54 heads east toward New London. 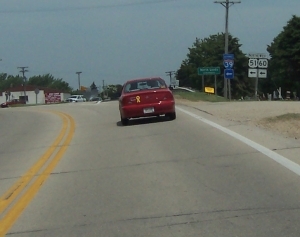 At this point, Highway 22 joins Highway 110 and heads for rodeo country in the form of Manawa. Yes, it’s east-central Wisconsin, and I said rodeo country! Manawa (pop. 1,330) is home to the annual Manawa Midwestern Rodeo, which has been active for over 55 years – bring your boots. In winter, you can use the rodeo grounds to access the network of snowmobile trails, of which there are 165 miles in Waupaca County. There are 21 snowmobile clubs in just the county maintaining these trails. After departing Manawa and the combo with Highway 110, Highway 22 heads east again. Dropping into a nice little valley over the Wolf River and through the town of Symco, I knew I was away from it all when the dominant station on my radio was called “Moose Country” – it’s AM 960, for all you country buffs. Highway 22 reaches U.S. Highway 45 at a junction with Highway 76, which continues east. We head north with U.S. 45 for several miles into Clintonville (pop. 4,559), which is named after first settler Norman Clinton as opposed to the former president. This small city is home to Seagrave Fire Apparatus, the longest-running fire apparatus manufacturer in the nation. Its airport, Clintonville Municipal (CLI), is historically recognized as the birthplace of Wisconsin Central Airlines, which eventually became North Central and then Republic Airlines, which in 1986 was purchased by Northwest Orient Airlines. Today, it’s all part of Delta Air Lines. 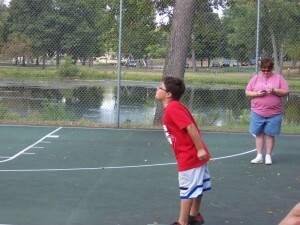 Clintonville is also a water city: along with recreation and fishing on Pigeon Lake and along the Pigeon River, Clintonville won the “Best Tasting Water in Wisconsin” contest in 2005, as sponsored by the WWA. Shortly after Clintonville is a town many have heard of when commercials or shows are pointing out interesting American place names: Embarrass, Wisconsin. Embarrass (pop. 487) is a small village, named after the river that flows through it. And they’re not ashamed to say it! Shawano (pop. 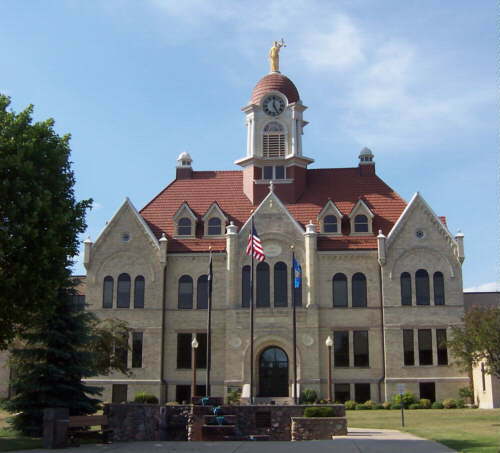 8,298) is the county seat of Shawano County and is the largest town on Highway 22. Abutting Shawano Lake, it’s also the largest town between Green Bay and Wausau along Highway 29 and is a major point along the Mountain-Bay Trail, a great 83-mile rail-to-trail bike route that connects Rib Mountain in Wausau with the shore of Green Bay. Highway 22 doesn’t exactly traverse tons of major cities, so Shawano seemed like a metropolis compared to most towns on the route. The cheapest gas on the route is here, as well as restaurants and hotels. The stretch of Green Bay Avenue lasts for several miles and combines State Trunk Tour Highways 22, 47, 55 and the old – now Business – 29. The mainline Highway 29 now runs south of town on a freeway bypass. 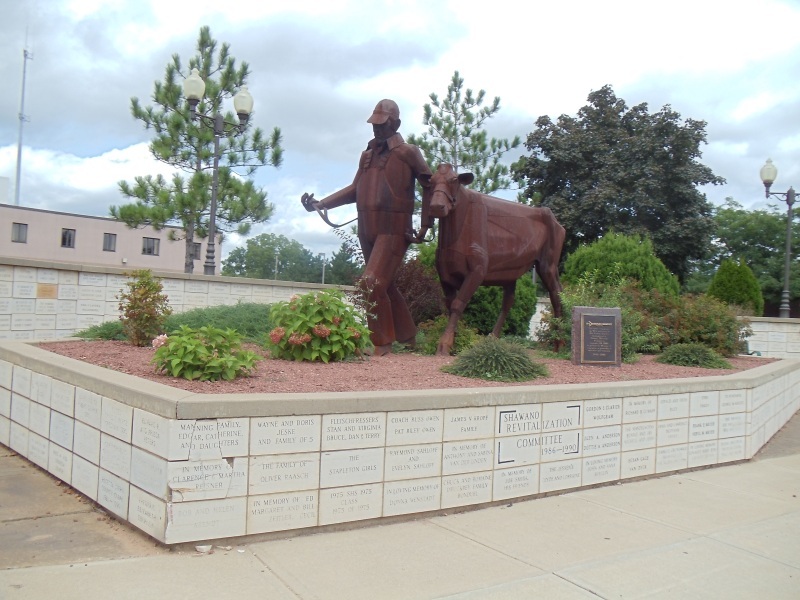 At the junction of these highways downtown, this attractive statue illustrates the farming history – and hard work put in – of the area surrounding the city. This statue marks the downtown crossroads in Shawano. 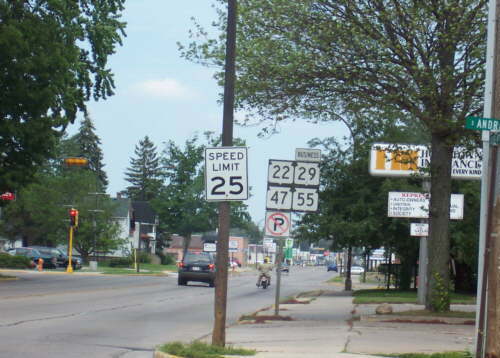 Four State Trunk Highways converge and go through Shawano’s main drag: 22, 47, 55, and “Business” 29, which was the mainline 29 until they built the bypass. From the “You Never Know What You’ll See on a State Trunk Tour” Dept: a camel grazes in the front yard of a home along the main drag downtown. The Shawano County Fair was in town at the moment – we can only assume there was a connection there. 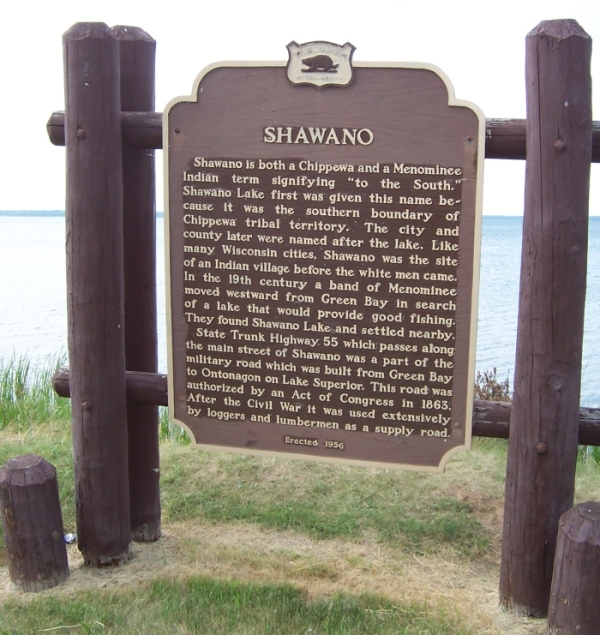 Shawano is considered by many to be “up north”, but its Native American name is actually “to the south.” At 6,100 acres, Shawano Lake was big enough to mark the southern border of Chippewa tribal territory. 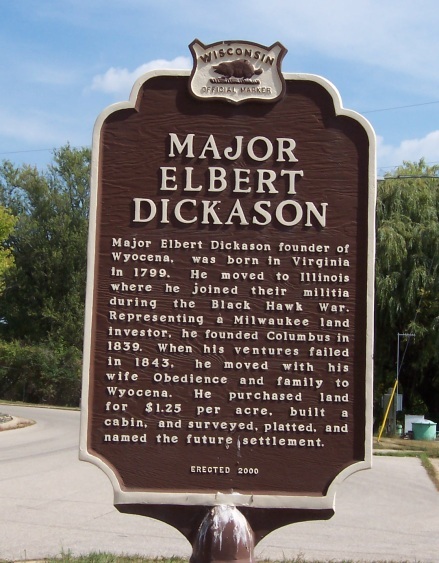 Highway 22 runs for over seven miles along the lake’s southern shore, passing a historical marker (pictured below) that tells you more. 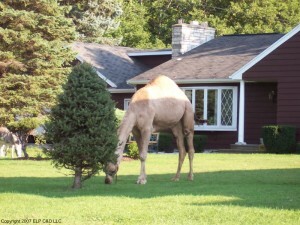 Meanwhile, you run into Cecil (perhaps a Shawano suburb? Maybe?) and make your way towards the highway’s final easterly push. …and paralleling much of the way is the Old Highway 22, making us thankful for modern engineering. 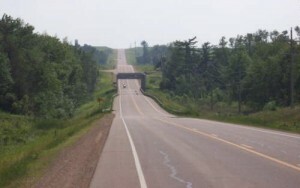 From Gillett – via car, truck, motorcycle, or ATV – Highway 22 more or less follows the Oconto River into Oconto Falls (pop. 2,843), a lovely town where a dam expands the river into a more lake-like recreation setting. The dam, of course, replaced the “falls” part of Oconto Falls in 1883, but they chose to keep the original name. Built on sawmills and solidified on papermaking, Oconto Falls continues to be a source for tissue and other paper products that get shipped all over the world, some of which have to perform very unenviable tasks. Rising like a wooden dinner fork, this tree provided a nice foreground subject with the dammed (not damned, dammed) Oconto River in the background. A nice day at the riverside beach in Oconto Falls. 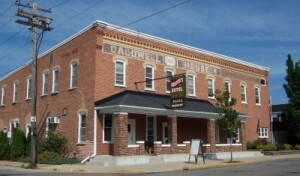 Built in 1885, the Caldwell House hosted new workers and visitors to the pulping operations of the time. They came often by railroad, which came to Oconto Falls two years earlier. The last eight or so miles of Highway 22 is a pleasant, peaceful drive on the way to its eastern end. 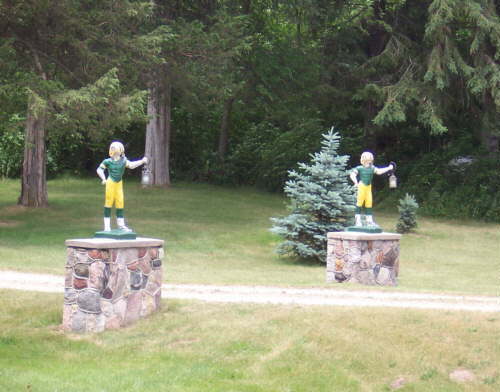 Right before it ends, though, you approach the outskirts of Oconto and some fascinating history at Copper Culture State Park. This park contains artifacts over 5,000 years old, is a former Native American burial ground – the oldest cemetery site in Wisconsin – and one of the oldest metal use archeological sites in North America. The park is free to visit, although you are encouraged to make a donation at the Werrenbroeck Museum, which takes care of the area and also chronicles the area’s extensive Belgian history. No, they do not make waffles. Highway 22 comes to an end at the western edge of Oconto (pop. 4,513), which is now bypassed to the west by an expressway upgrade of U.S. 41. Highway 22 technically ends at the highway, but used to continue east to the “old” 41, where more of the activity is. Oconto is the seat of Oconto County and shares a similar history with Oconto Falls in that lumber, sawmills, and papermaking were all important industries. 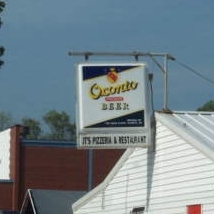 Old-school beer drinkers may recall Oconto Beer, and signs sporting the brand are still up in various parts of town. Oconto borders the waters of Green Bay, however, as serves as a port city between Green Bay and Marinette. Consequently, it’s where they build Cruisers Yachts, a luxury pleasure boat manufacturer established here in 1953. Oconto also has a long history of producing gloves – not surprisingly, considering the winter climate – and during the 1930s Oconto’s Holt Company was the largest producer of maple flooring in the United States. The city is the main town between Green Bay and Marinette, has a view of Wisconsin’s Door County peninsula across the bay, and it’s where we reach the eastern end of Highway 22 on the State Trunk Tour. 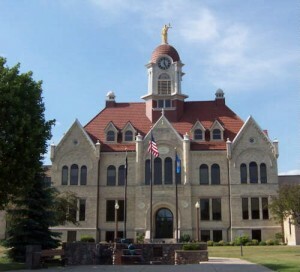 For those who imbibe too much, the lovely Oconto County Courthouse is not far away.